I was recently contacted by one of our readers, Cassandra, asking if I would share about Dachshund seizures since they are so common. In the 12 years I have owned Dachshunds, and walked and house-sat Dachshunds, I have never encountered a seizure. I have heard of Dachshunds having them before but didn’t realize how common they were. I looked into Doxie seizures and found a great article on the Everyone Loves a Dachshund site. You can read about the three types of seizures here – Dachshund seizures. So what should you do if you suspect your dog is having a seizure? The best thing to do when your dog has a seizure is move all objects away from him, place a pillow or thick blanket under him to avoid self-inflicted injuries, and let nature take it’s course. 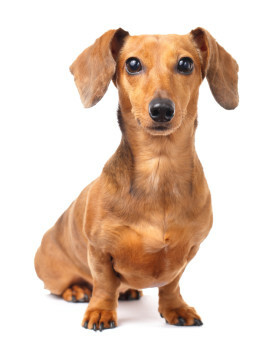 Sometimes, talking to your dachshund in a soothing voice can help him relax and come out of the seizure more smoothly. The first time your dog has a seizure, it is a good idea to visit a veterinarian. It will be helpful to your vet if you take notes about the conditions before and after and the seizure, as well as the duration. The vet will run some tests to determine what kind of seizure it was and hopefully be able to determine the cause. Some dogs might require medication to control the seizures. Seizures can be scary but many dogs genetically predisposed to them continue to live a normal life. Have you ever experienced seizures in one of your dogs? Please share your experience with us in the comments so others can learn from it. GREAT blog! I am so glad my comment “inspired” you to post it! It was all news to me, too, at the time and I now keep a closer eye on Miss Macy!!! It was pretty scary, but “forewarned is forearmed” so thanks for following up! Yeah, thanks for reminding me that it’s a common issue. I am glad more people will know about it now. thank you so much for your information, I have friend who has a dachshund that had her first seizure, the poor girl is distress, as is the owner. It scared him, he thought he was going to lose her at this time she is recovering very well. Talking to her owner, while he is holding her he has been talking to comfort her. A vet has been contacted by email and we are waiting for a response, your information has comforted both of them even myself thank you for the information. Knowledge is power. Hi Charity. I am so glad my article helped. I wrote it at the request of a reader but had never experienced it myself before. About two weeks ago, one of the Dachshunds I was dog sitting had a seizure. I wouldn’t have known what it was, and known what to do, if I hadn’t researched and written this article! I am glad your friend’s pup is recovering well. Thank you for the tips. I was dog sitting a Dachshund that had a seizure once but haven’t dealt with this issue on a regular basis. My Pebbles started having seizures today, she vomited clear foamy liquid, then became limp almost lifeless. After a few minutes she recovered but would not eat or drink. She is 12 yrs. old it is very heartbreaking and scary. I don’t have pet insurance or income coming in, no vet, obviously will help. I’m at a loss. Hi Jason. How scary to see with your pup. A dog often won’t eat or drink if they are stressed and I’m sure the seizure experience freaked her out. I assume she started eating at some point? I am not vet, and you should always check with one before starting a new supplement, but I’ve heard that help CBS has helped many dogs with seizures. I understand that your funds, and therefore options, are limited but I thought I would mention it. Here is an article I wrote about it: http://youdidwhatwithyourweiner.com/health-benefits-of-hemp-cbd-oil-for-dogs/ Good luck to you guys. I have a Doxie mix who’s had a couple of seizures. Mine starts trembling prior to a seizure. If you can get yourself together when a seizure starts grab your phone and video the seizure so you can show your vet what happened. Dawn – that is scary. Unfortunately, it’s not uncommon for a dog to have seizures they can’t find a cause for. Hopefully the medication continues to help. I’ve also heard from many, many people that have had success with reducing seizures in their dog by using CBD oil. Here is an article I wrote about CBD: https://youdidwhatwithyourweiner.com/health-benefits-of-hemp-cbd-oil-for-dogs/. Good luck. Hello, I recently rescued a sweet 6 year old Mini Dachshund. She appears healthy, except for her teeth. I know nothing about this breed, so I knew nothing about their likelihood of seizures. This little 8 pound angel has had 3 seizures thus far. (approx. a month). The last one, 2 days ago, lasted forever. (over 6 minutes) I thought for sure we were going to lose her. I immediately grabbed her and wrapped her tightly in a baby blanket. Spoke softly to her and rocked her like a baby. I am convinced the touch and love pulled her out of it. She is back to normal today, but she is very clingy to me. Someone said they have terrible food allergies. Is that true? Welcome to the world of Dachshund owners. They’re great little dogs. I’m sorry to hear your new pup is having seizures. I am sure it’s very scary. Hopefully you can get her to the vet and they can find a cause. Hello, my name is Seana and I have a doxie female that has seizures and a 12 yr old Chihuahua. I have a chi/Pitt mix, that I’m just waiting for her to start having them coz if being pitts r prone to them. But my doxie has been having them more and more. Can u tell me y she’s having them. I’m scared coz I don’t have the money to take her to the vet. Hi Seana. I’m sorry to year your baby is having seizures. Unfortunately, only a veterinarian can tell you why so you will have to figure out a way to take her. Sometimes the vet can’t find an exact reason and may just put her on medication to control them. Other times, it could be a sign of a brain tumor or serious neurological damage. That’s why it’s important to have a vet check her out. Some veterinarians will take payment plans if you ask. Good luck. My Honey had a seizure about 3 years ago. Not knowing about them, or what could have caused it, I rushed her to the animal hospital. Living in South Florida, poisonous toads are a serious threat, so I had to rule that out. After keeping her overnight, and $500.00, they told me to keep an eye on her, and if it happened again, contact a neurologist. It has never happened again, THANK GOD! Whew! Glad it only happened once. I have never seen a dog have a seizure in person but I am sure it is scary. I watched a few videos on YouTube but it’s totally different when it’s your baby and it’s happening right in front of you. My mini dapple doxie Dexter has one once about every 3 to 4 months. He is 5 years old and they started around 3 years old. They always initiate with him pacing and restless, then he will suddenly stand very stiff and still, sometimes his head will sway back and forth. I cannot tell you how disturbing the first couple ones were. The whole thing lasts about 10 to 15 minutes. With soothing talk and maintaining safety around him he seems little affected by the event. He does seem somewhat sleepier afterwards and every time after the event he vomits a small amount. Then life goes back to normal. Thanks for explaining about the signs you see before it happens. It might help me and others recognize what behavior means we should watch our Doxies closely for seizure symptoms. I hope to never have to deal with it but I would always rather be prepared to be safe. I have the same experiences with my 5 year old. I rescued him a year ago and he has had a seizure about every 3 months. He gets needy, then stiffens, goes blank and drools. The last one he fell over and flopped all over the place. Once he vomited afterwards. He is tired after. Took him to the Vet after the first one and the blood work was normal. Just tracking now. It is scary but he is fine after. Talking him through it and soothing him at least makes me feel good if not him. Thanks for article to show its not always life threatening. It’s not always life threatening but I would still always take a pup to the vet that is having their first one (like you did). If they can’t find anything wrong, sometimes it’s just something that has to be ridden out. I know I was less freaked out about the recent seizure with the pup I was dog sitting because of the research for this article. Hopefully it helps others too. My Dachshund mix just had his first seizure at 8 months old. He is staying at the vet ovrenight and I am very worried. He did not come out of his seizure very “peppy” or active and his vision is bad. We took him immediately of course I am just wondering if anyone has ever seen something this bad happen and then they come right out of it. I’m praying so hard for him, we are willing to treat him any way we can. Please share experiences. Oh no, I am so sorry. I usually hear of dogs coming out of seizures and everything going back to normal. I hope they get the underlying cause figured out and that your pups vision and energy improves. Thank you for sharing your experience Mary. I am sorry for Freddie and your family. That must be tough to go through. My Harley has them she is exhausted after a seizure, I’ve noticed Harley do sent drink as much water as my chihuahua does. I’ve read some where to give her honey & milk so when I notice she is getting tired of give her honey &milk so far she hasn’t had any more. I have phenobarbital to give her but I’m worried it’s to harsh. Harleys last seizure was bad my husband said, he etold me he holds her and pets her & loves on her & when she starts to pant he knows she is fine! Could it be she is not getting enough to liquids? I’ve had her checked for epilepsy she don’t have that the vet said it just a miss fire to her brain, Harley is the smartest pup I’ve every had! Hi Lisa. Seizures is not something I know a lot about. I did some research for this article but I didn’t see anything about them being related to hydration levels. It could be though I suppose. I do know in people that being dehydrated can affect your brain negatively so perhaps it does the same in dogs. Chester and Gretel drink different amounts of water too. Chester is like a camel. Gretel drinks a lot less than him. Neither Chester drinking a lot of Gretel not drinking that much is concerning for me though. Dogs are just different. If you are worried about Harley’s hydration though, I might switch to a raw food if you haven’t because it has more moisture. You can also take a little bowl of water and put a splash of no, or very low sodium chicken broth in it and give that to Harley a couple of times a day. I’m sorry Harley goes through this. It’s rough for everyone involved. My dashsand has had seizures once a month since he was 4 months old. One was so bad that he stopped breathing so I had test after test done at vet, 3,000 later, and nothing was found. After that seizure they stopped for a year and now are back every month. I don’t know what to do next without paying a lot of money. Will meds help? His seizures last hours with head movement back and fourth and stiffness. Then he sleeps for hours. I just want to take care of him the best I can. Hi Amy. Sorry to hear your pup’s seizures are back and frequent. They sound pretty severe too. I assume you have spoken with your vet about this new series of episodes? If they couldn’t find a reason last time, I am not sure, personally, I would go through a bunch of tests to try to see if they can find something now. I would probably to right to exploring medications to help control them. I know that not all medications work for all dogs but I am sure they would have some suggestions. I also know that high doses of HEMP CBD has been shown to help siexures. I’ve heard that sometimes actuall medical marijuana will help too (if they are more severe). I know it’s possible for a dog to overdose on marijuana though (but not Hemp CBD) so I would not receomment trying to go that route on your own. If you want to try something like that, I 100% suggest calling around to find a holistic vet that is open-minded to that kind of treatment. Awww Lynnel, that sounds heartbreaking. I would be like your husband and constantly checking afterward. I am sure that seizures are taxing on the body and several in a row might be too much to handle. I watched a couple of videos on YouTube of Doxies having a seizure so I knew what to expect and one guy spent a long time talking to his dog in a soothing voice while it was happening. Thanks for leaving a comment. It’s interesting that you mention shaking being related to her heat cycle. My puppy is 7 months old and has been having these shaking episodes (doesn’t look like a seizure to me, and the vet doesn’t think so either, but the shaking is pretty significant) and acts like their is pain in her abdomen. We did about every test there was and couldn’t find anything. Some friends mentioned her heat and asked if her behavior might be related. Now I am thinking it may be. I’m glad you are able to manage your pup’s symptoms and that she seems healthy otherwise. Check the pups for Liver Shunts. Only male dapple has had 2 mini seizures due to his shunt. The signs are sometimes easy to miss but very important to take care of. so glad you have posted this, my sweet little puppy mill rescue started having them a few years back. the first one was after she came in from outdoors, i thought she had eaten something poisonous. i rushed her to the vet, i freaked out. freaked!! (i got a long lecture on remaining calm). she has had only had 5 or 6 but the vet started her on phenobarbital, she also has thyroid issues and takes meds for that too. i still freak out and it’s just not in my nature to leave her be. i wrap her in her favorite bankie and reassure as much as i can. i will definitely visit the site you recommended. thank you thank you….love to your doxies and to all the ones you foster. We have had two doxie s whom suffered from seizures . Our first Brindle, would get sifted legged, and stumble. I would scoop him up and just hold him until it was over. They were conciered petite seizures. We had him over twenty rears ago, our vets at the time had no diagnosis. Max was our second victim, he would become stiffed legged, arched back and involuntary head movments. We kept increasing his medications with no help. He had a stroke and we had to put him to sleep. We also had a small terrier mix that we had on phenobarbital for about 10 years, to control his. Seizures are really scary, but once you know what you are dealing with, you can help your fur kid get through it. One evening I was lying quietly on my bed partaking in a “distant prayer” healing session with a woman offering to help me with my stress level and sadness. The time she designated for me to get up, my Maggie Mae that was under the bed started having an episode. She was trying to get up, but her legs weren’t working! She ended up laying down and she was shaking and moving her head. I immediately knew she was seizing. I couldn’t help but wonder if it had something to do with the energy and the distant healing. It took about 7 minutes for her to come around. She at times doesn’t have one for months, then she starts up, but tries to get up and is breakdancing. I keep her calm and sooth her, until she comes around. Sometimes shes showing signs that shes startled, and then it hits, because I suppose she senses it coming. We manage it ourselves. I grew up with a poodle that had seizures. Maggie is going on 9 years old. This has been occuring for about 2 years. I almost forfor to mention, that sometimes, when she starts shaking, I put a bit of honey or carol syrup in her mouth, and it helps. Hum—-wonder if it could be blood sugar? Enough said….we live with it. Someone else mentioned the honey thing too. I am sure seizures can be caused by many things and I wouldn’t be surprised if it was blood sugar with some. I have worked with animals for over 35 years and I have seen a lot of doxies with paralysis, which I have helped. No one ever called me about the seizures though. I also work with people and have helped many individuals with frequent seizures to go from many times a day to rarely having one. I would expect I could help the doxies with that problem as well. To see what I do go to . My 9 year old miniature doxie Coco had her 1st seizure last August, it was a full grand mal – body seized up muscles clenched, legs moving involuntarily, stopped breathing & foamed at mouth. The 1st one lasted about 3 minutes. We called the vet & they told us to watched her & call back if she had another. We went over 12 hours and then she had another grand mal lasting about 3 minutes. The vet couldn’t identify the cause so gave her a 10 day course of diazapam. A month later she had 2 grand mal seizures back to back lasting about 7 minutes and the vet put her on phenobarbital which she will take for the rest of her life. She didn’t have another seizure until November. Thanksgiving weekend she had a completely different type of seizure where her head started pulling to the left, she couldn’t walks & was scooting in a circle to the left then would shake all over (like after a bath) and then repeat. This one lasted about 10 minutes. These circling seizures increased in frequency from once to several a day over the course of only 3 days so we took her to the vet and they again did blood work but this time when doing the exam her pupils were unevenly dilated. We were sent to a neurologist with the suspicion of a brain tumor and they did blood tests, a spinal tap & an MRI. I’m sharing this because the circling seizure was an indicator of a life threatening condition and the neurologist told us that our early recognition didn’t guarantee her survival but gave her a fighting chance and that most of the time by the time dogs reach him they are already “circling the drain” and he’s unable to save them. What she had was encephalitis – swelling of her brain caused by her immune system attacking her brain. He suspected the cause was an untreated infection (most common cause) – hers was actually related to inflammation caused by a reaction to a clotting agent used in her IVDD surgery almost a year prior – it manifested much slower than normal because of the steroids used in her recovery (steroids are one of the treatments for encephalitis). She underwent treatment and is now on an immune suppressant and phenobarbital (for the rest of her life) and steroids which we hope to be able to discontinue at some point. Please get help immediately if you notice what you think is a circling seizure like I’m describing – if you can get a video of it (cell phone?) that’s even better so you can show the vet to help in diagnosis. Note the time of occurrence & length of the seizure. We were told even a few more days would have meant likely losing my girl. This is an fairly rare situation, but rapid intervention makes all the difference. To the fur parents who have lost your little loves, my deepest condolences – Coco is my furry soulmate and I dread that day with my whole being and am so grateful for every day we get together. Thank you so much for sharing your story! Knowing this will be really helpful to myself and others that read it. I know that head pressing – where a dog stands near a wall with their head pressed into it – signals a bad things too. I think maybe something similar to what you described. Anyway, I am super glad that you caught the issue soon and your baby is still with you. Epilectic seizures are relatively common in doxies as a breed. We discovered this when researching them prior to adopting our first little girl, Bree. We recently adopted a rescue dapple male, Patches, and we knew he had canine epilepsy prior to adopting him. We were told his seizures are readily managed with drugs, specifically phenobarbitol. While really distressing to me to watch, Patches shakes off his episodes after about 5 to 10 mins. We’ve had to up the dosage of pheno over the last few months, but otherwise, he’s a lovely little guy with lots of energy and fun in him. Please don’t ever be afraid of adopting / taking a dog with canine epilepsy ! it is so easily managed with affordable drugs (approx $20 / month). We look forward to years of happiness with Patches, and hopefully take him on a hike one day ! Figured she may not have recognized me. She acted similar to when there is a thunder storm. I honestly thought she would attack me which was shocking to say the least. She is extremely loyal to me and close to me. She was nervous for approx 1 hr and kept staring at what seemed like a imaginary thing in the room. Then she relaxed, curled up on my legs and fell asleep. She woke up normal. I am sorry that your pup had to experience that. I imagine it’s very stressful, both physically and mentally, so I am not surprised that she was not herself for a bit afterward. Thanks for stopping by to share your experience. My Dachshund Roscoe is 2 1/2 years old and had his first seizure 2 months ago. It almost scared me to death. We were getting ready to go to bed, he went out to potty and about 5 min later my husband heard a bumping sound on the deck. He went out to check , brought him in the house screaming, CALL THE VET. Our Veterinarian met us at his office and he thought he had gotten a toad. After we were there about 15 min he started trembling, threw up, and was ok after that. His blood work was within normal limits. Last week he had another seizure. This time we had already been asleep a couple of hours. He started shaking and I knew what was happening, so I just put my arm around him and comforted him. It didn’t last long, and when he started wagging his tail I knew he was coming out of it. We got up when he started gagging and trembling and again he threw up and was fine. I called the vet the next day and he said we shouldn’t put him on medication until he has them more frequent (daily). Since then I have been cooking his food and snacks, and praying he never has another one. I am not seeing much about the trembling and throwing up after the seizure, but hope this is also common and not something more serious. Just hope this is information that will be helpful to someone. Also this does look like it is happening around a full moon. Thanks you so much for sharing your story Cathy. I think that everyone’s different experiences can help people get a good picture of what to expect if their dog has a seizure. My mini long girl Ellie has seizures and always comes for a snuggle when they start. She goes as stiff as a board followed by uncontrolled shaking and occasionally bulging eyes followed by eyes watering. Whenever it happens all that’s needed is a calm reassuring voice and gentle stroking. Within 10 mins she’s fine and wants to play tennis ball (her fave game). She used to empty out afterwards but this appears to have stopped now. Ellie is 8 and is lucky that our other 4 mini longs know to give her some comforting licks. That kind of sounds like my experience with this pup. He was stiff and grunting a little. He was standing but his legs were bent like he was trying to stabilize himself. He was drooling a little and and his eyes were bugging out. Since it wasn’t my dog, and the owner hadn’t told me that he has seizures in the past, I rushed him to the vet. In the 10 minutes it took me to get there and be able to talk to someone, he was coming out of it. When we got back home, he wanted to play ball again and was totally fine. I am lucky I’ve never an experience like that with Chester or Gretel but now I feel better prepared if it does happen. My doxie mix rescue has seizures. The first 3 occurred within 2 days of applying topical flea medication Advantix. In researching I found that many of these products reduce seizure thresholds in dogs with seizures. She is now on Bravecto which we have used with no associated seizures. She still has an occasional seizures, but less frequently, and no pattern that I notice. I’ve heard that topical flea medication can give some dogs trouble. I am glad you figured out that’s what was causing it and found something that worked. I had no idea about this. I’m sharing this to my Facebook page so some of my friends with dachshunds can read it too. I would have been so scared if this happened to my doxie, Heidi. At least now my husband and I can be prepared. Thank you so much. Thank you so much for having this web page and posting this growing concern! Our 8 yr old doxie Boomer started having seizures about 5 years ago. He told us that sometimes there are things that set them off…for example, a certain food, change in weather, car ride, a stressful situation etc. When Boomer’s seizures became more frequent we changed his food to an organic formula and began to give him meds, 16mg. of phenobarbital a day. After 3 years, we only needed to increase his meds by 8 mg. Yet recently, his seizures have been increasing. Last night he had 2 grand mal seizure about 4 hours apart from each other. He falls on his side, starts shaking, gets stiff and stops breathing for a short period! It’s one of the worse experiences I have ever had to witness! As soon as the vet was open we took him in. He recommended we give him even more meds. Now he’s on 32 mg. a day! My heart breaks for him because I know he doesn’t feel well and the meds are making him super loopy. I pray this increase in meds keeps his seizures under control, because I don’t know what I am going to do. Has anyone had the experience where meds didn’t really work? Your comments are welcome! Thank you again for posting this wonderful doxie blog! That sounds scary and frustrating. My Mom had to take a lot of medication when I was a kid. I know how it can help one thing but be harmful in other ways. They couldn’t find a particular cause for the seizures? My dachshund started having seizures at about 14 months old. They were coming more frequently, like every week. Did all the blood panels and everything looked normal. Vet wanted to put her on Phenobarbital but I wanted KBr. She was on only KBr for a couple of weeks but I didn’t like what it was doing to her, so I decreased by half over a couple of weeks until I weaned her off of it altogether. I switched her to a natural food made from lamb and oatmeal, threw out all of my room deodorizers, cleaning solvents and scented candles. Only feed treats from Newman’s Own, that have no wheat flour or preservatives. She has been seizure free for almost 2 years. I joined a group called EPIL-K9, where I got excellent advice on what to omit from my furkid’s environment. We are doing just fine. Our 12 year old dapple has had 3 seizures now…about 1 per year. This morning it happened again. He wakes up and sprints to the kitchen, when we get to him he is usually on his side salivating and having spasms. We just all sit with him and talk to him until he finally comes out of it. It’s like a switch has been flipped and he immediately wags his tail and starts licking us probably wondering how we all got out in the kitchen. It was very helpful to hear all of you stories and has given me some good ideas to try. I took the day off just to hang out with him. Long live Doxies!! How sweet that you took the day off to keep your pup company. I am sure that seizures can be scary for all involved. My little dachshund had her first seizure last night. We had several people over and they all showed up at the same time. I think she may have just been overstimulated. She fell down and began to shake all over. It was so scary! After a few minutes she stopped shaking. It took about 15min for her to regain orientation. I’m hoping this does not continue! How scary for you and your pup. I hope it is not a regular thing too. My 4 year old wirehair dachshund Heidi had her first seizure in August of 2014. I had a previous dachshund with seizures growing up, so I did not freak out and waited until she had another in February of 2015. I went to the vet, she took tests, and did not seem to think it was anything other than epilepsy. She then had three within two months (following 4 months of no seizures), which is still not enough to put on medication, until the vet finally believed me that they were lasting ten minutes. Her fifth seizure left her with a very very high fever of 104.5 (dogs are normal up to about 101.5) and she had to get fluids. This is when my doctor decided to put her on KEPPRA, which is a human seizure medication (so we have to 1/8th pills), and it is known as being not affordable, but dachshunds are so so small that it is very affordable ($15/month) and it does not have the negative effects that phenobarbitryl has. Please ask your vet about this. She got on meds in August 2015 and had her first seizure on meds in December and just had another yesterday. It is still lasting ~8 minutes, so I am supposed to film the next one so the vet can make sure I am not stopping the timer to late, but if it is really this long (it is), she thinks we may want to up her dosage (which would still only be $30/month). This medication does not have any effect on the liver like other medications, but vets are used to dismissing it due to the high cost, but again, doxies are so small that it is not unreasonable. I just wanted everyone to know that although she is having seizures still, the medicina is out there and side effects are much less severe. ALSO, please have a thermometer on hand and take the dogs temperature after the seizure. It should almost immediately be back to normal (about 5 minutes after seizure is done). If it is not, this is dangerous, because if they dog has another seizure with a high temperature, that could be life threatening, even if it is a short one. (Seizures elevate temp. and if the temp. is already elevated, it’s not good). Thank you for this information Kim. It is very helpful. I know that people are often concerned about the side effects of medication used to treat things like this. The worry is that, although the medication might fix one thing, it is doing harm in another way. It is nice to know there are other options out there. We have a 3 year old female and she just had a seizure. I now realize she had one about 4 months ago too. It was very scary and I truly thought she was dying and could not imagine how I was going to tell my daughter as Milly is hers. My daughter had seizures as a child from 9 years old until she was 13, so we knew a little about them. However it still breaks my heart and I am very concerned about her. I am taking her to the dr. today for advise on how to handle them and what I can do if one last to long. So far the first was only about 2 minutes and this last one was about 4 or 5 from start to finish. I was really hoping she was not going to have anymore but now that we have connected the two I feel like she will. I am hoping since they are so far apart that maybe she will not needs meds and when she had this last one I didn’t know what was going on until it was over. I just noticed she was having a hard time walking and I grabbed her up and yelled for my husband. He came and we both took her inside and called a friend that it s vet. As I was holding her and telling her it would be ok my husband said she is coming around. He took her and sat her down and she was back to normal. For someone that has never seen something like this it is very scary but I know that it is just her brain trying to reset itself as I put it and she will be fine as soon as it is. My question is.. Is it ok for me to hold her and comfort her and tell her it will be ok or should I just leave her on the ground and talk to her? Thank you for your website as it gave me answers right away and I know for sure she had had a seizure. I saw a seizure first hand with a dog I was watching and, although not as bad as what you are describing, it was scary. Part of the reason it was scary is that the owner failed to tell me that her dog had seizures in the past. Did you ask the vet about her sensitivity in her armpit? It sounds like maybe she tweaked her shoulder. She could have something else going on to so I would be sure to get it checked out. That’s not normal. My doxie was 18 years 3 months 10 days old. He went to sleep after we decided that his health would not improve. He had 4 seizures in 2 weeks. The last being very long. We rushed him to the vet. They offered blood tests, a scan and would put him on a medication. The fact is, he no longer chased squirrels, jumped, climbed or wanted to go on long walks. His left eye developed a white film. His hind legs were weakening (splitting). He still loved to eat and drink water and enjoyed being massaged or pet. He never ever had a seizure. It was a very hard decision and I am wrecked and I hope we made the correct decision based on his age and reduction in athletic ability along with the sudden development of the seizures. My little Peco is 8 he had his second seizure yesterday. They were almost a year apart. He was shaking uncontrollably, his eyes were fogged over and he was unresponsive and stiff. Afterward he was disoriented and wobbly and had to go to the bathroom. Both times scared me and my 14 year old son to death. With them being a year apart I didn’t think seizure at first I just thought I was going to loose my baby. He is doing fine now and was fine after the seizure. Hi Wendy. Sorry it took me so long to respond. Your experience does sound very scary. I’ve only seen a seizure in person once. The symptoms where not that bad but it still scared me a lot. I am glad to hear your pup is doing fine now. My 10 year old dachshund started having seizures this year 🙁 its so heartbreaking. First time it happened she was flopping around like a fish all over the floor, i just calmly talked to her and tried to get her to stay on a blanket. Awww… poor thing. I bet the first time was extra scary. I’m sure you’ve learned the signs and how to best deal with it now. My dachshund Precious turned 4 years old this past June and one day my Uncle came to my house and she got excited and fell down my steps, they are hard wood steps. Ever since then, when she gets too excited she goes into a seizures. They gotten longer since the 1st time. She goes in circles, falls overs, foams at the mouth, pees and now poops. I pet her and nicely talk to her. She gets up and acts like nothing happens. I’m sorry to hear you two have to go through that. It’s good that she seems fine after though. I have one little 7 pd black and Tan mini Smooth. He is now 5 and he started having Siezures we wantt to say at 1 year old or about. So most of his life. We had him tested and the vet could find nothing. What happens is he gets very lathargic & His whole body shakes and he has no control at all. It really freaks him out. We take and hold him in his faorite blanket ( He is comforted more with my husband then with me ). He then sleeps and is very cuddly after his 2-10 min Shaking. He has them often and we do not know what brings them on. We are also surprised that the Vet finds nothing in testing. Suggestions on testing? He comes out of it and is fine. He is a otherwise healthy sweet, playful puppy. None of his sisters or momma have this issue. Advice is more then welcome. Thank you for the Blog. I have been a bit with lost with this, I know he comes out of it and is ok, but to not be able to help him has always bothered us. Thank you so much. I wonder if anyone has looked into food allergies as a cause. I have tried over the years to eliminate one food at a time, and it seems as though beef may be the culprit. I have been making my dogs (mini dachshund) food for months, (ground chicken, rice and vegetables) and she was seizure free. Running out of food and being desperate I bought some dry food and it wasn’t two days later she had the worst seizure I have ever seen. She doesn’t lose consciousness, just shakes and spasms, then seems confused for a few minutes once the seizure has passed. Vets ask me to take a video of the seizure and still say just keep an eye on her. I really recommend looking into your dogs diet. SO GLAD to have stumbled across this website & post! My 5yr old male mini doxie Oscar suffers regular seizures. He has been on phenobarbital for 3yrs now. His first seizure scared the be-jesus out of me, I thought he was dead because he was limp & unconscious. Until today, reading this post, I never knew the breed was predisposed!! Oscar’s vet never mentioned it & is likely unaware as well. Usually Oscar’s seizures last about 5-10mins, but about a yr ago while we were driving across country he was seizing FOR A 4 HR PERIOD!! Because we were on the road we had a hard time finding a vet or animal hospital to take him, it was one of the worst experiences of my life!! We found a vet after about an hr of searching online but that vet could not get him to come out of the seizure & believe it or not SENT US ON OUR WAY BECAUSE THE OFFICE WAS CLOSING!!! I could not believe such careless behavior from a so-called professional. We had no choice but to get back on the road in search for another vet to help. 3 hrs later we FINALLY found an after hrs hospital & THINK GOODNESS Oscar was finally brought out of it! And by some miracle, he was just fine with no lasting damage. We feared the worst after him being out so long, but he was back to his crazy self in no time. He now takes the phenobarbital & I also carry a syringe of liquid Valium in the chance he has another seizure he is unable to wake from. He has had seizures since then, usually every 3-4months, but they have been normal since that horrible ordeal. Again, I just wanted to mention how happy I am to find this site & to share my baby Oscar’s story. It’s so great to learn he is not alone in his condition, and nor am I!!! Oh, that sounds horrible and scary. I’m so sorry that happened to yo guys and Oscar. I can’t believe that one vet sent you on your way! I’m glad, it worked out for you guys and, now that you know it’s common in Dachshunds, that you don’t feel so alone in dealing with it. I really enjoyed reading all of the comments people have posted. my 2 year old girl got very stiff and started shaking, scared me to death. It’s certainly scary if you don’t know what is happening! I had never seen a dog seizure in person before writing this article but my researched helped me to know what it “looks like” when it’s happening and what to do. Then I was dog sitting and one of the dogs had a seizure. I knew what it was but it was still scary because the owner failed to tell me that her dog sometimes had them. I thought it ate poison or something! Good luck to you guys and hopefully it was just as isolated incident. We experienced a seizure for the first time last night with our eight-year-old Doxie Hans. It was very very scary it came on all of a sudden thank God my son was with me because I was the one freaking out. It was a grand mal seizure and so he was convulsing wildly foaming at the mouth and he lost control of his bowels poor guy. We rushed him to the hospital and the vet said this is not uncommon and he could have another one during the night which he did but it was much milder. I’m taking him to my local vet today for blood work and observation. After both seizures he is very disoriented as if he doesn’t know his way around the house or is there for the first time . He is like this for about an hour afterwards and then falls asleep . Thanks for the article it is reassuring to know information. Hi Bernadette. Sorry for the late reply. I swore I responded to you but apparently not. I’m sorry that you’re going through this with your pup. I’m glad your son was there to help though. Were they able to find a cause for Hans’ seizures? Unfortunately, I know they aren’t able to in all dogs. Hello. I Adopted my Sweet Snoopy when he was 11 years old from a local shelter about 4 years ago. We knew is was older and promised to give him the best last years of his life. He has been really good health wise since we have had him, and for a 15 year old dog I couldn’t ask for anything better! But last Thursday evening around 10:30 I found my poor dog having a seizure on the floor. He came out of it, and seemed to be ok and I kept a close eye on him throughout the night. The next morning he had another one, I rushed him to the vet and they took some blood, gave him some valium and sent me home. I had to wait until the next morning to call about the blood results. My poor Snoopy then proceeded to have 5 more seizures about every 3 1/2 to 4 hours the rest of the day. I was at a loss and the vets office had closed at noon that day. I kept if touch with a friend of mine who works at another vets office and she walked me through each seizure. The blood results came back all ok, so I am still at a loss as to why this happened. He seems to be almost back to normal and hasn’t had another seizure in 5 days. Although he seems to still be suffering from some minor vision loss and is a little bit wobbly.We took him off the Valium and we have him taking some CBD dog treats. I really hope he doesn’t have anymore as he is 15 years old and don’t want to put him through a bunch of tests, nor do I have $2000 for an MRI. If they happen again I will take him back to the vets and see what else can be done to try and get a little longer with my sweet dog. I have owned many Dachshunds and didn’t know they where so prone to seizures. Thanks for the information, just wanted to share my story. Hi Jennifer. I do appreciate you sharing your story so others can know they are not alone. I don’t know much about seizures personally but I do know that it’s not unusual that the vet can’t find a cause. In those cases, I think they just manage them long-term with medication. Thanks for giving Snoopy such a great life. Although the seizures are unsettling, hopefully they are just little events you have to deal with but that otherwise don’t affect his enjoyment of life. My son has a mini long hair Dixie. He had his first seizures when he was a year old. He is a little over 2 now. He has seizures when he gets excited. We took him on his first vacation. He handled the drive Pretty good. But we went into the mountains 2 days in he has 2 seizures. Spent the rest of the vacation keeping ours eyes on him. Looking for advice on how to take my buddy on trips. I have a Chiweenie (half dachshund half chihuahua) who has had two seizures in the first year we have had him. The first time was horrifying: his back legs gave out on him, his eyes glazed over, he was making these uncomfortable grunting sounds, and he eventually just flopped on the ground. He was still conscious and when we called his name he looked at us and was responding to us. He did not foam, urinate, or defecate. The whole seizure took about a minute. I wrapped him in a blanket while my fiance called an Uber to take him to the emergency vet. While we were waiting for the Uber he came out of it and starting licking my face. The Second seizure he had was when I was waking up to go to work. He got up from his bed and hopped into bed and curled up next to me under the covers. He immediately started to make the same uncomfortable grunting sounds and he started to shake. I pulled the covers back and told my fiance to start filming it on his phone. The seizure was over before I could pull back the covers (about 20 seconds) and it took him another 2 minutes to fully come out of it. When he came out of it he was bouncing up and down wanting to play. 1. Don’t panic! It won’t help you or your dog and having a plan in effect in case it does happen will help you stay calm. 2. Keep talking to your dog this will help keep both of you calm. 3. Its a good idea to keep your dog safe by putting pillows or blankets around him, BUT NEVER WRAP HIM OR SWADDLE HIM IN A BLANKET. This was a big mistake I made when my dog had his first seizure. During a seizure your dog’s body temperature elevates. Wrapping him in a blanket will cause him to overheat which can potentially cause brain damage or even death. 4. Try to video record your dogs seizure. This is not as sadistic as it sounds. Recording your dogs seizure will help your vet see what kinds of symptoms your dog has and will help you plan for future seizures. it can also help your vet diagnose whether your dog truly had a seizure and what might have caused it. Video recording will also help you time how long the seizure lasts. If a seizure lasts more than 5 minutes your dog can overheat and you should get him to an emergency vet immediately. 5. Every pet owner should have an emergency vet already in mind. When my dog had his first seizure we weren’t sure where to take him and my fiance called two other vets before he found the one we ended up seeing. Lucky for us, our emergency vet was amazing and was reasonably priced. But it would be super frustrating if we spent time while our dog was having a seizure trying to find a vet and then the one we found totally sucked. Ask around, check our Yelp, see if your regular vet offers 24 hour emergency services (Some do and some don’t: neither my dog vet nor my rabbit vet does). Just have a good emergency vets number programmed into your phone. I’m sorry about your pup but thanks for sharing your tips. I’ve only experienced doggie seizures once myself. Thank you for this article, and thanks to those who have left comments as well, as they’ve been very helpful. I just adopted my Barney about a month ago, and he’s had 2 “episodes” since I got him. The first one was so mild that I couldn’t really say it was a seizure – it looked more like his leg fell asleep or something. He was on my bed with me and sleeping – and suddenly jumped up and crawled up the bed to be right next to me, dragging his back legs behind him. I got up and put him gently on the floor, and he staggered down the hallway, bouncing off the walls as he went – and about a minute later, he was fine, running around, wanting to go outside and playing with the cat. The one he had today was particularly bad. He likes to sleep on the recliner, and leaped down off of it and ran over to me, tail between his legs, trembling. I immediately stopped working to see what was going on with him, because he was obviously terrified. He stood absolutely still, but was shaking SO hard, and then one of his front legs came up and straight out in front of him – then one of his back legs did the same. Then he put them down, and the other back leg did the same thing – up and out, stiff and straight, like he couldn’t control them. He kind of wobbled around, trying to walk, but never fell over. I was concerned about picking him up, for fear it might be his back, but I finally did it and put him back up on the chair so he would lay down without hurting himself and had his favorite, familiar blanket near him so he could smell it. After about 5 minutes, he calmed down and has been resting quietly since then. I did notice that after the episode ended, he was gulping and swallowing a lot, and droplets of foam came out of his mouth – so that was another seizure indicator. I’m almost 100% sure that’s what it was now. I just lost my large-breed dog (he was a very old guy) about a month before I got this little guy – a dog with the same name, same coat color, just much smaller. I would be devastated to lose my new dog so quickly. From what I’m reading, it appears the seizures are relatively harmless and are just a genetic factor of the breed….I hope that’s all it is. We’ll be going to the vet to get checked out, though. I’m sorry for your loss, Sue. I’m glad Barney was ok in the end and, yes, seizures are often harmless from what I understand. I hope the vet was able to help you out. My little girl Doxie is 12 years old. When she was less than a year old, she fell from a height of about 4’. She immediately began to have a seizure. I panicked and didn’t know how to handle it. As I was driving, trying to find a Vet the seizure subsided and she went right right back to normal. I have spoken to Vets who attribute her seizures to brain trauma all though she is otherwise completely normal. She typically has seizures once every 3 months. They last about 2 minutes. During her seizures the following happens: she becomes stiff and in a awkward position. She looses control of her legs and cannot walk. Her pupils compelety dialate and her eyes look black. She appears to not be able to see. She shakes uncontrollably. Her eyes water. I have been told she is not in pain when these occur and they are not frequent enough for medication. They tend to happen when she has experienced a great deal of stress such as many people in the home or me being away from her for more than 2 days if I am on a trip and she is with my mother. When she has a seizure I lay beside her wherever she is and pet her gently. I repeat over and over in soft voice that “mamma is right here” and “it’s going to be okay”. I know this calms her because she leans in to my voice and starts to breathe more normally. Once the seizure ends, I wait for her to return to a standing position. This does not happen until her pupils return to normal size. I offer her water which she often rejects and then I get honey and let her lick from my fingers. Honey seems to calm her. Within about 10 minutes of her seizure she begins functioning back to normal. Even though the vet was not too worried, those episodes must be a bit unnerving. I was dog sitting a Dachshund and he had a seizure similar to what you described. I have a 13 week old daschun. She has been having episodes of head bobbling, falling over, and then today she went crazy with extreme excitement barking uncontrollably and running in circles . At first I though she was playing although this was new behavior but it kept up for more than 30 minutes. Finally she sat down for a minute and that’s where I could see that she was bobbing and weaving all over the place and kinda fell over when she tried to walk. I picked her up and she went completely limp but was still breathing. She then started vomiting 3 separate times. She has been in this lathargic state for an hour. Does it take them a while to come back. She is breathing and eyes are open but otherwise she is unresponsive. Hi Leah. That definitely sounds like a seizure to me (but I am no vet) and sounds like a very scary experience. It’s my understanding that it can take dogs different lengths of time to recover but an hour definitely sounds on the long end. I would take her to the vet to see if they can diagnose the problem or at least reassure you that their is no harmful cause. Thank you for this article mine just had his second one in 2 months. Now I don’t know if one has ever happened before while I wasn’t home. But reading this article eased my heart a lot. He has the shaking type. And they last about a minute. I grab him as quickly as I can hold him securely next to me talking to him an soothing him. He seems to come out of them pretty calm. Just exhausted the poor baby. I went threw this before but with my sisters dog but he was 15 when is started and 20 when he passed. I was shocked that this is a common problem with this particular breed. Poor babies. Hi DeAnne. I’v experienced it with a Dachshund I was taking care of once. It’s was definitely scary but he also recovered from the episode pretty quick. It’s always good to get these things checked out at the vet but sometimes, unfortunately, the “answer” is “we don’t know why”.